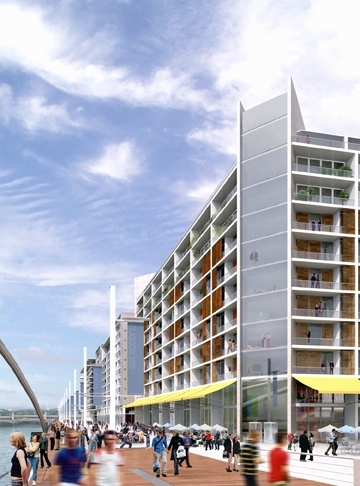 Plans unveiled for £300m residential & leisure development on site adj. River Clyde. A planning application has been submitted to Glasgow City Council to transform three blocks overlooking the River Clyde in Tradeston. Three architecture practices have been contracted by Alburn, Glasgow City Council (GCC)’s preferred developer. The redevelopment of the blocks in Kingston Street is the first step in GCC’s ten-year masterplan to regenerate Tradeston from a rundown area to a desirable riverside community. Alburn Tradeston Ltd plans to turn the three blocks into 955 luxury apartments with underground parking, 90,000sq ft of leisure and retail. The Tradeston site is to be linked to Glasgow city centre (plus Broomielaw, Glasgow’s financial district) with the RRP Glasgow pedestrian bridge. Three architectural firms have already been contracted by Alburn. Rosemount Properties are the agents for Alburn. Phase 2 will be slowed down a bit. Historic Scotland have refused permission for demolition and their decision has been supported by Culture Minister Patricia Ferguson thus upsetting the developers (Alburn Tradeston) and Glasgow City Council.